Burger Bar is just what it sounds like – a burger joint with a bar scene. The atmosphere is cool and industrial with tufted red leather booths and a vintage feel. The front of the restaurant has a bar and lounge area with couches and arm chairs to relax and nibble. There is a large outdoor courtyard area with a bar and seating where you’ll often find live music like local favorite “The One Man Band.” They have different nightly specials like Ladies Night and $2 Sliders & Beers and are an easy and consistent go-to spot for lunch, dinner or a drink. The menu is playful with a ton of burger options and catchy name to match each. 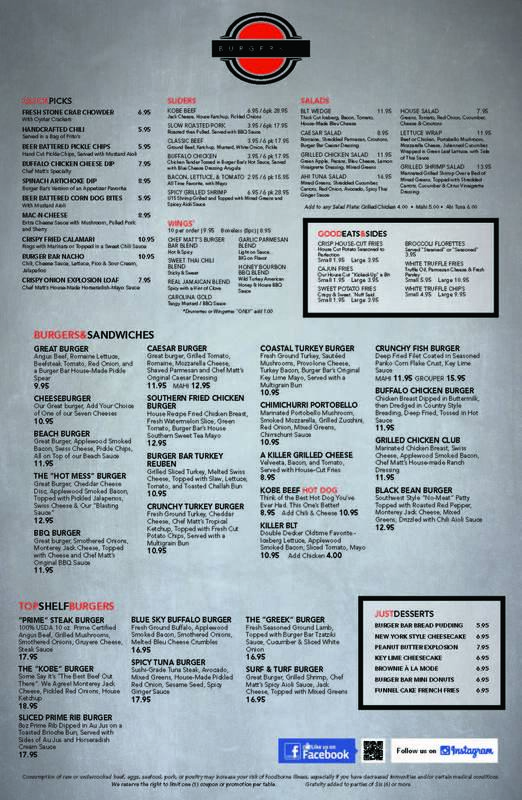 They even have a “Top Shelf” Burger Menu with items like the Prime Steak Burger, Kobe Burger, Sliced Prime Rid Burger, Spicy Tuna Burger, Surf and Turf Burger, etc. Oddly enough, my husband typically orders their chicken wings which he really likes. He goes with the Honey Bourbon BBQ Wings and a side of the House Cut Fries – you can also get them Cajun for more of a kick. Or if you’re feeling fancy you can get White Truffle Fries or Chips. My “usual” is the Coastal Turkey Burger with provolone, mushrooms, turkey bacon and key lime mayo – yum! – with a side of Sweet Potato Fries. On this particular evening I decided to get a taste for some new stuff and it was $2 slider night so I got a Roasted Pork Slider, Classic Beef Slider and Buffalo Chicken Slider. The buffalo sauce was really hot (I’m a big baby when it comes to heat though) but I liked all of the sliders. They have a legit bar scene with a good selection of beers, wines, speciality cocktails, tropical drinks and martinis, coffee drinks (think Frangelico, Bailey’s…) and adult milkshakes like the Chocolate Black Russian with vodka, kahlua, chocolate syrup and vanilla ice cream. They also host “Rush Hour” Happy Hour Monday-Thursday 4-7pm and Friday 3-7pm. Burger Bar is a local favorite and great place to grab a bite in a fun atmosphere.